You are currently browsing the category archive for the ‘Music Philosophy’ category. I was having a coffee discussion today with my friend (and fantastic bassist) Kevin MacIntire about what drives musical/artistic progress in individuals. We spoke and thought about the various forms of work ethic in young musicians, and also our own journeys as instrumentalists. As a somewhat regular private lesson instructor, I can speak from experience in saying that there is a noticeable difference between students who desire accomplishment/status in the music industry vs a skillful relationship to their drum kit. It’s like the love of money vs the love of the game. Which makes someone work harder? We all know that “hard work” is necessary in achieving any form of progress, but what is the end goal of the work? Where does the desire to work hard at something originate? Does financial gain produce the same work ethic as inspiration? Jacob Slichter, well-known music writer and drummer for Semisonic, has written a brilliant 5-part series called Hearing Musical Time. The articles capture and comment on elements of groove, tone, Drummer Disease, listening perspective, playing to a click, and a boat load of other important concepts. All five parts are worth reading if you’re the kind of person who likes getting wiser. Me, when I was younger… trying to be a professional musician. I posted a link to Danny Barnes’ wisdom once already this year, and if he keeps writing articles with such compelling and spot-on content then I’ll probably link to him again. Dawes is a band that wasn’t on my radar until recently. I think I dig their thing, but I know I dig this performance. It’s hard to sound good on tv and these guys nailed it. The main point behind this post is to acknowledge Griffin Goldsmith on drums and bgv’s, and I want to zero in on his effortless and relaxed demeanor. He’s doing some pretty difficult stuff but he doesn’t care. Again, I want to emphasize that he doesn’t seem to notice that playing a shaker with your right hand while the left hand covers both the hats and snare is supposed to be demanding. And then he sings great background stuff while keeping a locked groove with awesome feel. Does he look like it bothers him to do this? Does it look like he can barely keep it together? Nope. He’s just doing the deal and owning it and looking cool. I’ll go out on a limb and pontificate a little bit here: good musicians can do difficult stuff. GREAT musicians do difficult stuff but it’s not actually difficult for them anymore which means they don’t get distracted by the difficulty factor and instead just play what the music needs and totally nail it. I’ve written about this before. Something that you want to perform is either impossible for you to physically accomplish or you should know it so well that it’s easy. There shouldn’t be anything in between. Goldsmith’s drumming in the above video is a a good example. Every now and then I hear the super intellectual artsy types talk about drummers and how the good ones play “melodies.” Ok, so… I don’t want to be that guy who points out people’s grammar mistakes in Facebook posts or whatever, but seriously. Drummers don’t play melodies. We just don’t. That’s not the drumset’s job. It never has been and it never will be. “I love how melodic that guy is on the drums.” I feel like people who talk that way are trying to lend cred to the drumset, and I appreciate the effort, but it’s just too much of a stretch. Drummers simply don’t play melodies. 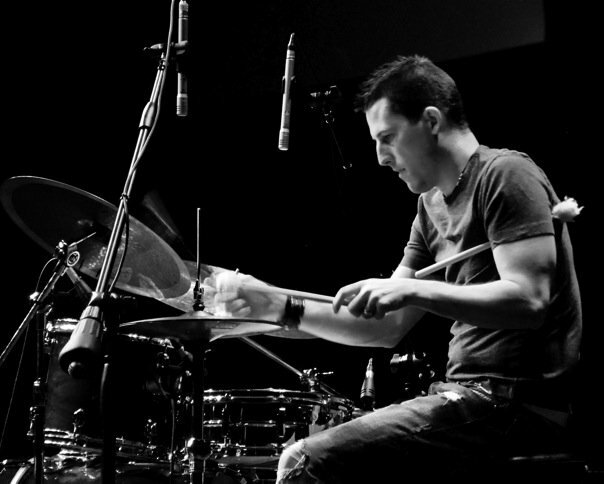 There are, however, a handful of ways drummers can participate in the melodic and harmonic aspects of music. I’ve been slowly learning these things over the past decade and they’ve really impacted my playing and how I view my role in the band. 1) Be aware of what key the song is in. The biggest impact this has for me is how I tune the snare drum. An open and ringy snare tone can add a lot of life and energy to a rock song, but not if the ring sustains at a bad interval with the key of the song. I typically try to tune the snare to either a tonic or a 5th, but major/minor 3rds can also be cool. Tuning toms to the key of the song can work well too, especially if you’re using them in the actual groove and not only in fills. For instance, check out the way Jay Bellerose uses the tuned rack tone instead of a hihat on this piece of awesomeness. And check out this wiki page on scale numbers if you don’t know what 5ths and 3rds are. 2) Go for “hooks” in your fills. The thing about a melody that everybody likes is its catchiness, or “hooky-ness” (in pop music terms). It’s something that everyone can sing along with… something that makes the song easily recognizable. Though a 12-tone scale can’t be played on a drumset, there’s nothing stopping us as drummers from playing HOOKS, especially in fills. Dave Grohl on “In Bloom” comes to mind here, or the iconic Phil Collins on “In The Air Tonight.” And you know what? Forget about just fills. What about timeless groove “hooks” like the intros to U2’s “Sunday Bloody Sunday” or Green Day’s “Longview?” While these references are certainly NOT melodies, they are genuine hooks nonetheless and the music is better because of them. 3) Know how to talk about melody and harmony. The rest of your band knows what scales and chords are. They know the difference between major and minor. You should too. It will make rehearsals and discussions easier for everyone, and it will help to offset the stigma that drummers aren’t “real” musicians. 4) Play in a way that tells a story. This is more of a soloing or improvising thing, but it can apply to any setting if you want it to. 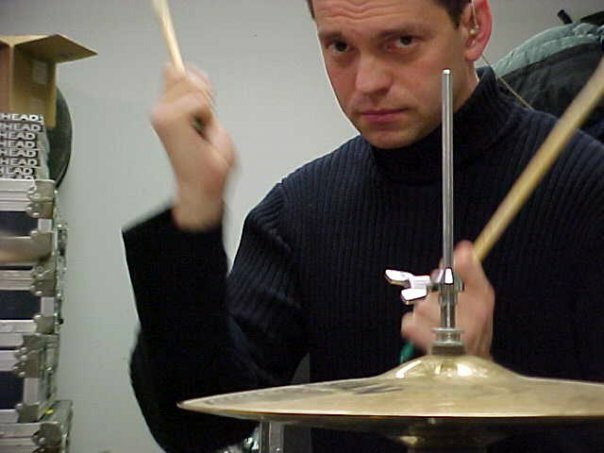 The idea is that you as the drummer spend time thinking and strategically planning what you’re going to play, instead of just mindlessly repeating the same groove over and over. I think this is what a lot of people mean when they reference “melodic” or “lyrical” drumming. And I’m not talking about being overly busy or changing things up just for variation’s sake. I’m talking about putting the kind of effort into the overall direction and crafting of your groove that songwriters put into their melodies and lyrics. 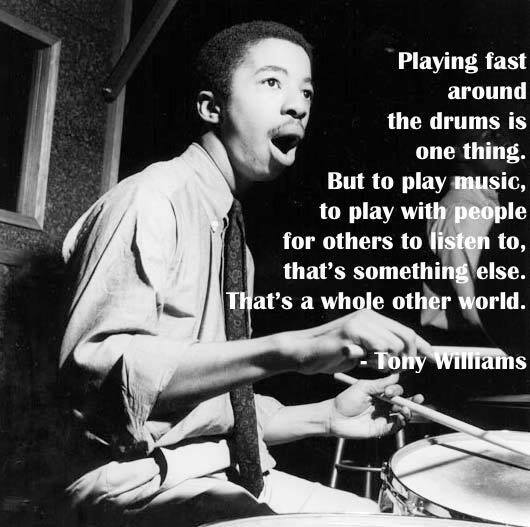 Summary: Suggesting that drummers should play “melodies” doesn’t make you sound smart, but knowing how to use a drumset to access the non-rhythmic elements of the music world sure does. Your job in the band is GROOVE, but that’s not the only realm where you can contribute. It’s not that using sheet music is bad or wrong or not cool, it’s that using sheet music is simply not necessary. Going that extra mile and immersing yourself in what you’re performing so much so that the sheet music is no longer needed – that is the kind of performance that most people are looking for. The two options for excellence: IMPROVISE your music, or MEMORIZE your music. Respect yourself and your audiences enough to do them this favor. I will get down off of my soapbox now. This is an odd time for me to finally post on this topic, which I’ve had in draft form for 8 months. Starting the “From The Archives” series has me motivated to keep the blog up, so I’m going through old drafts too. Back in February of this year I was sitting on an airplane with my friend Aaron Fabrinni as we travelled from Minneapolis to San Diego for a Go Fish gig. It wasn’t a typical Go Fish gig – the band was leading worship for 4 days at a Children’s Pastors Conference where we would play 7 different 20+ min sets. In the weeks leading up to our trip I had done gigs with over a dozen other artists (including a 90-min show subbing with Owl City, my first time playing with them) in addition to multiple Sunday morning church gigs. That might sound like a lot, but it’s really just a typical month for a freelance musician, and Aaron and I were discussing how we each approach the mask-switching acrobatics required to pull off performing so many different songs and styles in a short period of time. I’ve always considered this kind of thing to be 90% mental. For me, the physical difference between playing with one artist vs another has always felt similar to the physical difference between driving to one place in my town vs another place. Sure, I might have to use highway speeds for one trip and neighborhood speeds for another, or lots of turns as compared to a straight shot, but my arms don’t care about that. As long as I know where I’m going then I’ll be fine. My point here is to emphasize that juggling a ton different gigs is mainly, if not entirely, a task revolving around your MIND. So how does one prepare the mind for switching gears so rapidly and frequently? A few years ago I heard the term “uploading” in reference to learning/retaining music and I’ve stuck with it ever since. Basically, I think of my mind as a hard drive, with both RAM memory and hard disk memory. Stuff like Go Fish shows (and Owl City shows at this point) are hard disk. I’ve played that music so many times that I have it completely memorized, and I’m able to nail one of those performances regardless of how many other gigs are happening that same week. RAM memory is different. It has to be uploaded. It can be uploaded quickly, but likewise disappears quickly once I shut it off (i.e., go to sleep or stop focusing on it or whatever). My method for RAM gigs for as long as I can remember has been charting. I make detailed word document charts (not Nash number system, and not staff paper) while listening to the tracks I have to play. I can do this weeks or just days ahead of the actual gig, and then I of course bring the charts with me to the gig itself. However, the key for me has been to use the charts as cheat sheets – something that I only glance at during the gig if I need to. What I do is take some prep time on the day of the gig (as close to gig time as possible) to listen through to the tracks I’m playing while reading my charts. Then I’ll sometimes double down and go through the charts one more time without listening and imagine myself playing the tunes in real time (i.e., humming to myself and maybe even using a practice pad to tap out the patterns physically). This process “uploads” the music to RAM memory, and then when I walk out to play the gig the music feels almost as familiar as hard disk memory. The uploading is what takes my relationship with the music to the place where the chart becomes just a cheat sheet. I could probably play the gig without any uploading, but then I’d be scrambling to read my charts so closely that my listening would be hindered. I’ve made slight adjustments to this uploading process over time, but for the most part it’s been exactly as I just explained it for 10 years. So there it is. The interesting part about the timing of this post is that I haven’t used this process AT ALL for two months, so I’m wondering whether the RAM side of my mind has undergone any atrophy in not being used. I have a bunch of different gigs in December back home, so we’ll see what happens. Check out this short but interesting interview with prog master Bill Bruford. He makes some great points, though I can’t say I agree with all of them. Most notably, I’d submit that the information learned on the street is a far less “imperfect skills base” than that which is acquired in a formal music school. Sure, there are shortcomings, but I would GLADLY take the shortcomings from a street education rather than those of the classroom. And also… c’mon, I’ve heard many trained musicians play wrong notes. MANY. PS… I’m laughing super hard at this interviewer, who basically mumbles completely useless and unhelpful stock comments for the majority of the video. As a sort of follow-up post to my entitlement thoughts from a few months ago, I want to share this video that my friend Tristan Carnahan recently made as a submission to the Rode Microphones Rockumentary contest. I’m pumped that Tristan thought to use me for his subject, and also pumped about how it turned out. Also, check out the appearance of the stained glass RD kit that I had for a little while. Miss those drums. So beautiful.